With the 10 days geography board game, players improve their world geography. Each board game covers a country or continent. Award winning game including the Dr Smart Toy Award. 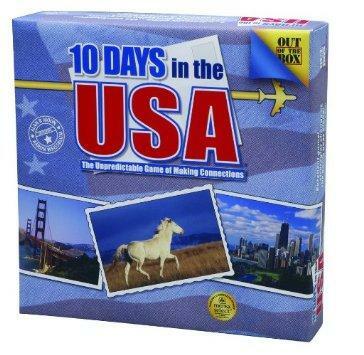 Out of the Box has the “10 Days” geography board games: the 10 Days Out of USA, 10 Days Out of Europe, 10 Days Out of Africa, 10 Days Out of Asia, etc. Each game is focused on one country or continent, therefore players learn about the geography of each country / continent. In the game, there is some excitement as players can travel a country by jet, car and on foot. For example, they can switch from car to jet (and go faster) when they choose to travel from one city to another. The game is designed for up to 4 players and for children ages 10 and up but even adults can thoroughly enjoy the game and improve their knowledge of geography in the process. In the 10 Days Out of USA game, kids have to plan their 10-day trip in the United States. To do this, they have to use the 50 destination tiles representing the states and the 16 transportation tiles representing the transportation methods. They draw these cards at the beginning of the game and they have to use them to plan their trip. Kids also have to figure out where their opponents are heading so as to try to block their advance. The game involves both strategy and luck which makes it really fun. It is educational as kids learn about the 50 states and the cities and about the geography of each state. Playing this really fun game, is also like taking a class on the geography of the United States without realizing it. There are other versions of this game covering other countries and continents. You can move to the other versions after you have finished the 10 Days Out of USA game and feel confident that your kid knows the geography of the US well. For example, in 10 Days Out of Europe, kids get to learn about the countries and the cities in Europe and are able to identify European countries on a map. The other versions are also very entertaining and very educational. It is worth pointing out that this geography board game has received many awards including the Dr Toy’s Smart Toy Award, the National Seal of Approval, the Parents Choice Gold Award and many more awards. We believe it is one of the best geography board games that you can get and that it is perfect for children above the age of 10 and for teenagers.